Most people have done well out of the Credit Card Accountability, Responsibility and Disclosure Act of 2009 (the "CARD Act"). Consumers face fewer "gotchas," shorter impositions of penalty interest rates, and lower and less frequent fees. Credit card companies are thriving financially and have better relationships with their customers, according to the record satisfaction levels across the industry recorded in the J.D. Power 2014 U.S. Credit Card Satisfaction Study. As discussed in "Are federal regulators up to protecting us?," the law has generally worked well. But recent news suggests one group may have been disadvantaged by it: those who use student credit cards. When Congress was drafting the CARD Act, one of its major concerns was the protection of students from unscrupulous lenders and pushy on-campus marketing campaigns. And one of the provisions it made was to stop colleges from keeping secret their cozy financial arrangements with card issuers. These agreements rewarded handsomely those educational institutions that signed up to them and actively promoted a particular card or issuer. Such agreements still exist but, since their mandatory publication (students and parents who want to view one can consult the public record), their number has plummeted. A Dec. 15 report from federal regulator the Consumer Financial Protection Bureau (CFPB) revealed a drop of nearly 70 percent, to 336 of these agreements in 2013, down from 1,045 in 2009. Over the same period, the amount received by colleges in royalties and bonuses under these programs dropped by nearly half, to $43 million. You may think that is no bad thing. But, as often happens with government regulations, there are unintended consequences that might be causing naive students even bigger problems. While colleges now have to publish any agreements they have with credit card companies, they're under no such obligation when it comes to other financial products. Who's surprised that the CFPB uncovered 852 schools that now have deals with providers of debit and prepaid cards? The problem is, the CARD Act arguably made credit cards the most benign of all plastic. A single unauthorized overdraft can land a debit cardholder with penalties equivalent to a 17,000 percent annual percentage rate, according to CFPB calculations. And, while there are now some quite good ones out there, the prepaid card market is currently an unregulated mess. Sometimes, incredibly high fees (some of them hidden) are imposed, and it's possible for the loss or theft of a card to result in the total loss of the (positive) balance on it. Who's more likely to fall into such traps than a young, innocent and inexperienced student? All this makes it very bad news that some colleges are automatically refunding "credit balances" (money left over from student loans and aid grants, once tuition and and other charges have been paid) on their favored debit or prepaid cards. Some of these are "riddled with fees," in the words of a recent article in The Washington Post. No annual, overlimit or foreign transaction fees. Sensible ongoing interest rates and limited late-payment penalty rates. That last point is important. Unlike debit and prepaid cards, just about all credit cards report to the three main credit bureaus, something that provides students with the opportunity to build their credit while they're still young. And that can make a huge difference to the interest rate paid (or getting approved at all) when the time comes to buy that first car, rent that first apartment or buy that first home. A good credit history can even help them land that first job. 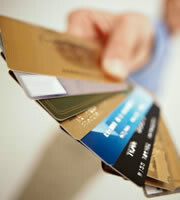 Of course, it's just as easy to wreck your credit with one of these cards as it is to build it. In this respect, students are like everyone else: some can resist the temptations provided by a line of credit, but some -- a minority of adults -- can't. So this article in no way seeks to persuade those students who can't manage their finances well to apply for credit cards. But it does urge young people to shop around for the financial product that best meets their personal needs. Whichever sort of plastic that is, they need to read and fully understand the agreement they ultimately sign up to. The CFPB notes, "Investigations by the Government Accountability Office, the Department of Education's Inspector General, and others have raised numerous concerns about conflicts of interest in these [college/card issuer] deals and their impact on students." Young people stand to discover a whole lot of useful things from their schools. But learning how to choose the plastic that best suits them may not be one of them. 0 Responses to "Regulation backfires for student credit cards"